DANNAR Mobile Power Station | Gonneville Inc.
DANNAR Mobile Power Station® (MPS®) series are the most complete maintenance and disaster response platforms on the market today, providing year-round infrastructure and off-road maintenance, disaster response, and supplemental off-grid export power. 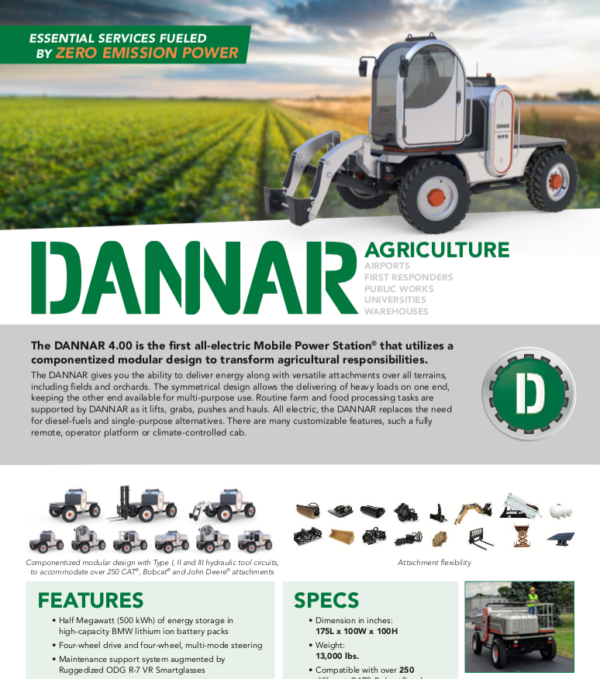 Every yard is full of many single-use heavy equipment and maintenance vehicles that can be replaced by a single DANNAR 3.00 or 4.00. With a towing capacity in excess of 600,000 pounds and optional work arms with a 7,000 pound load capacity, the DANNAR out performs traditional skid steers or track loaders. The onboard hydraulic power unit provides a universal quick plate for any CAT® Bobcat® or John Deere® attachments, as well as type I, II and III hydraulic tool circuits for chain saws, breakers or impact wrenches. 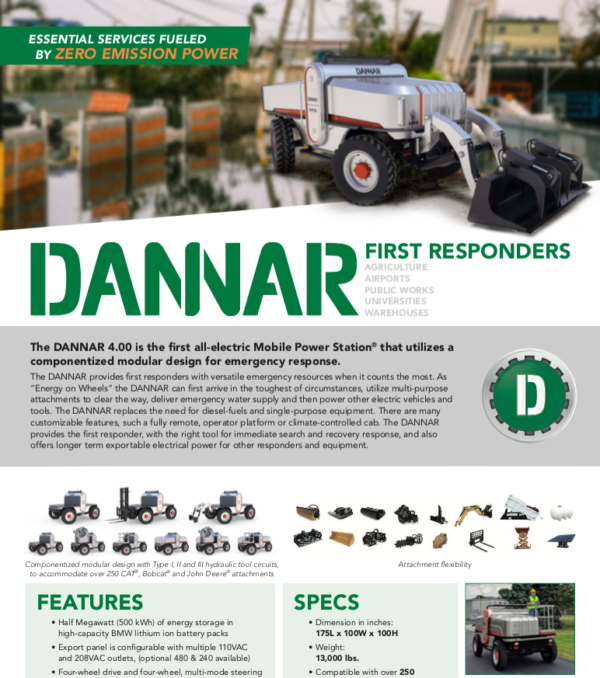 DANNAR Mobile Power Stations® are the first-of-its-kind disaster response vehicles that combines emergency power with the ability to clear destroyed streets and travel through nearly four feet of flood water. 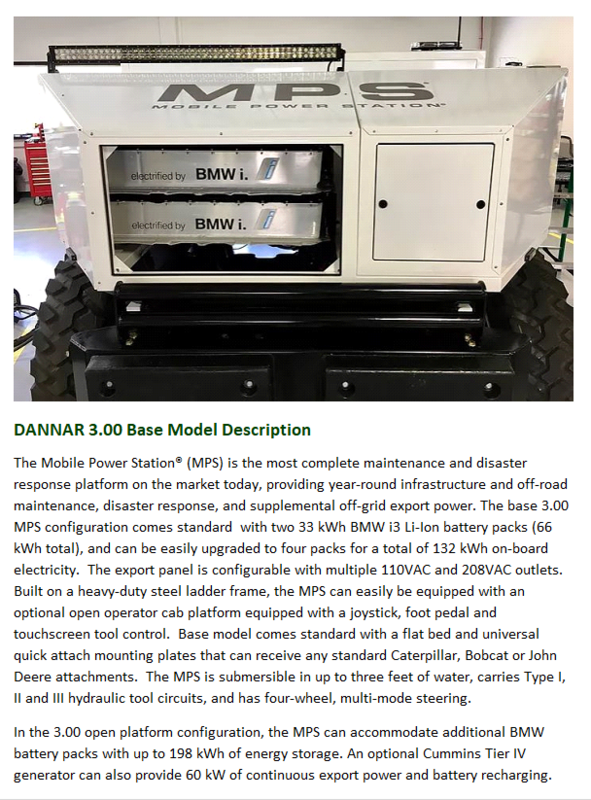 The base DANNAR 4.00 configuration comes standard with three 42 kWh BMW i3 Li-Ion battery packs (126 kWh total). An optional 60 kWh Tier 4 generator provides 600 kWh of continuous, off-grid electricity and battery recharging. 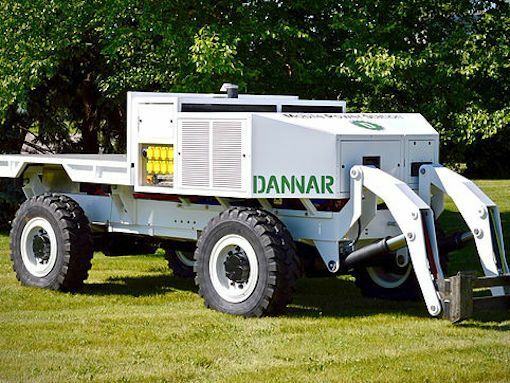 Combined with a 50-gallon fuel tank, the DANNAR can recharge itself for multiple days before refueling. What amount of energy is available? 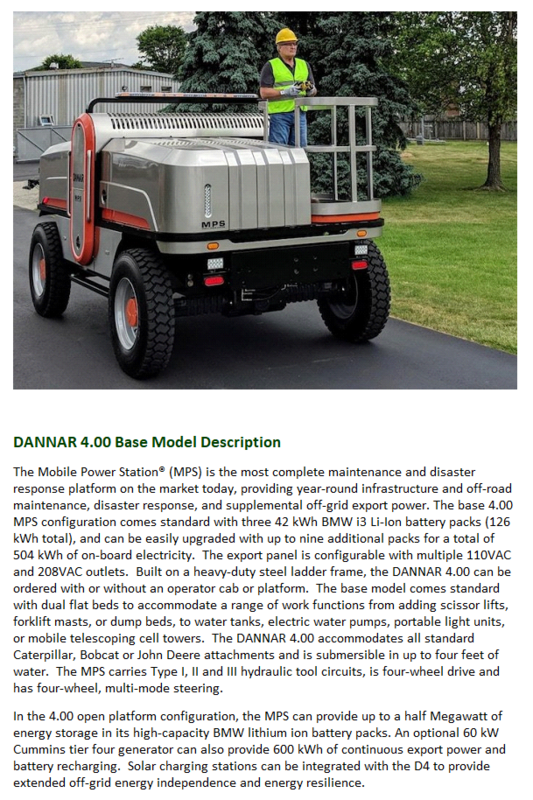 The DANNAR 4.00 comes standard with three battery packs that offer a minimum of 126 kWh of stored energy. A maximum of twelve battery packs per DANNAR can provide 504 kWh of energy. At a minimum this compares to two Tesla EV’s or work for eight to ten hours on site. How much energy do you need? Let us know and we will configure to your needs. 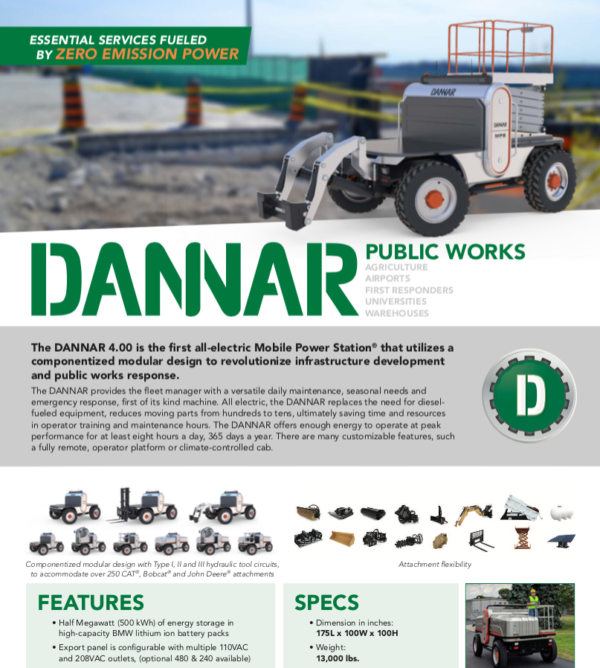 DANNAR Mobile Power Stations® are designed with the operator’s safety in mind. 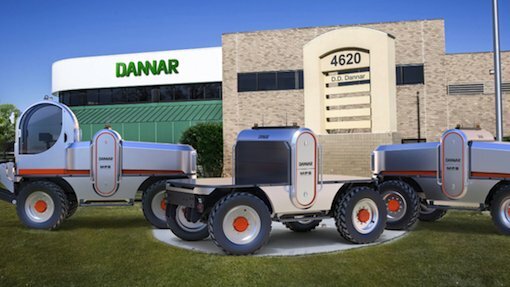 If configured without an operator work platform or climate-controlled cab, every DANNAR can be operated remotely. The DANNAR standard light bar can be configured to communicate visual motion and activity. What unique safety concerns do you have? Let us know so we can work together for operator safety. What types of attachments work with the DANNAR? Every DANNAR’s export panel is configurable with multiple 110VAC and 208VAC outlets, along with Type I, II and III hydraulic tool circuits. 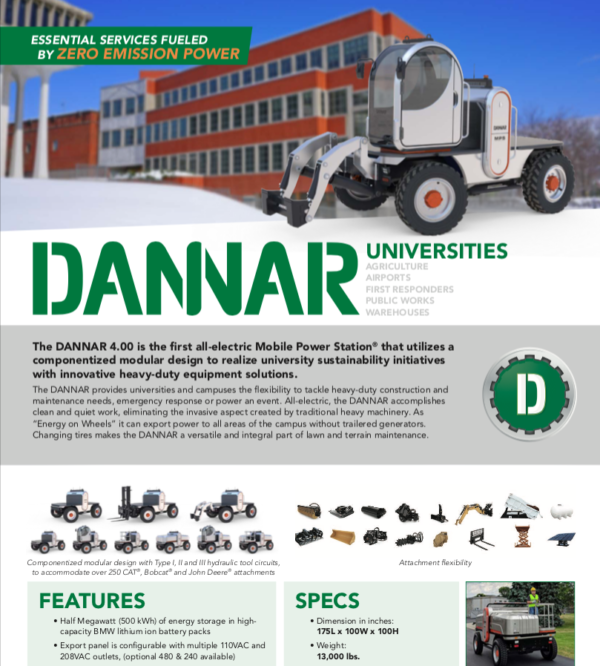 Over 250 CAT®, Bobcat® and John Deere® attachments can be powered by the DANNAR. What attachment or tasks do you need to accomplish? Let us know so we can work together for your DANNAR solution. 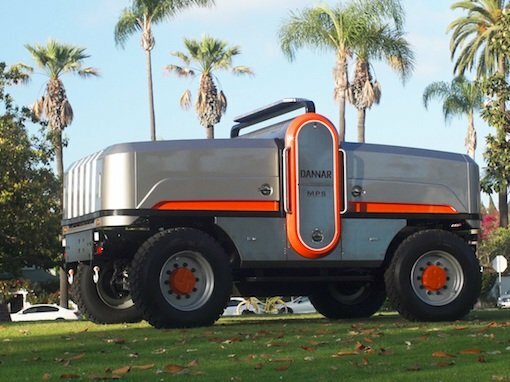 With its all-electric drivetrain, the DANNAR reduces moving parts from hundreds to tens. Fewer parts means less maintenance, which ultimately equates to saved dollars and time. Not sure how to start transitioning to reduced maintenance budget, zero-emission fleet? Share with us your current equipment needs and we can help you begin. What are other unique features? The DANNAR is submersible up to four feet. All electric means quiet, clean energy making it ideal for event and heavily populated settings. What is your unique need? We are here to listen. 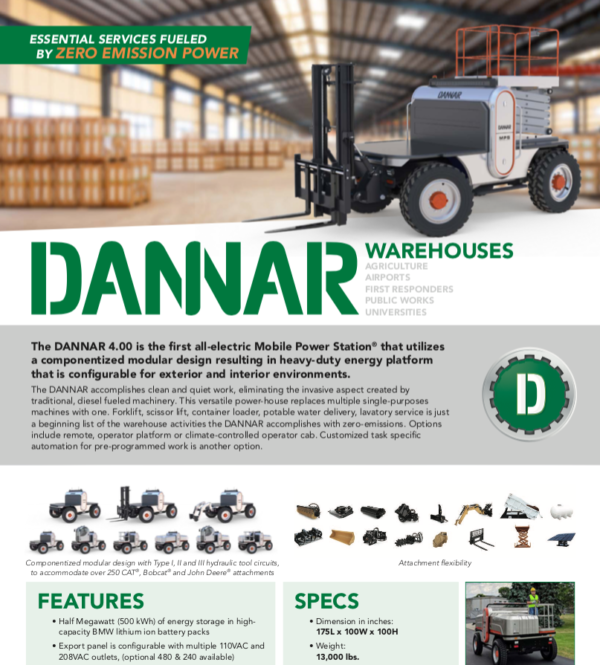 Learn more about how the DANNAR can be configured to meet the needs of your specific industry. Click the download link to read more! Click below to see where we are holding demonstrations, trade shows we are exhibiting or attending or to request a demonstration in your area!